Sensei Hassan Gad 5th Dan. (Interview by John Cheetham). Shoto's 'House of Many Rooms' - Different forms of Shotokan. l.T.K.F. 1990 Course. Report By Kenny Taylor. Sensei Mike Burnand 5th Dan Chief Instructor Z.K.G.B. (Interview). Club Profile. Seychelles Shotokan Karate Club. News from the J.K.A. (Japan Karate Association). SENSEI TAIJI KASE - Part Two (Interview by Dennis Tilley). Basic Ankle Training. By John Cheetham. MIKIO YAHARA'S Demonstrations. Photographic Report By Steve Tansley. S.K.I. (G.B.) Special one day Course. Report by Bozenna Tedder. Aberdeen Karate Festival 1990. Report by Dave McDonald. 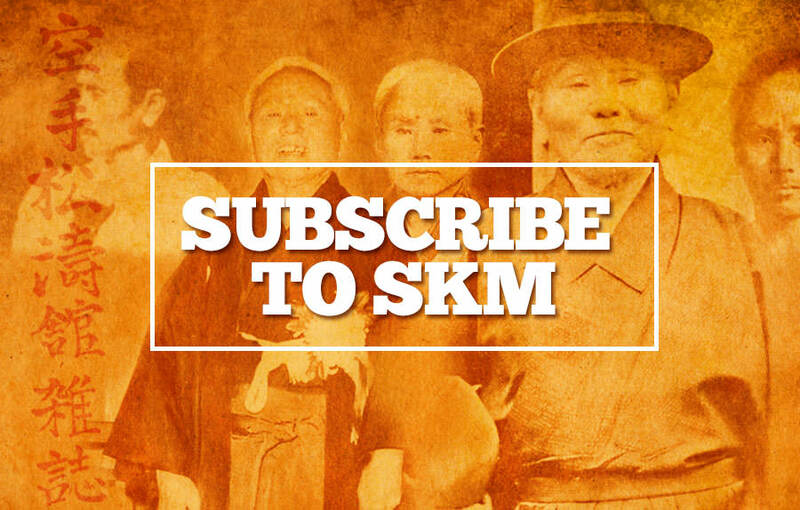 Welcome to the first edition of S.K.M. for 1991. There is certainly plenty going on in the SHOTOKAN World at the present time. In actual fact too much to report. The situation at the J.K.A. is reported in this edition with some very surprising new moves going on there. Obviously everyone is interested to know anything about the J.K.A., as this is and always was the 'HOME' of SHOTOKAN Karate-do. You could in fact say that the J.K.A. is the 'Mecca' for Shotokan Karate. It is very sad to see it split down the middle. Students have made the pilgrimage from all over the world since 1955 to visit and train at the Honbu Dojo in Tokyo. Both factions of the split still call themselves J.K.A. although only one side is registered as an Incorporated body with the Japanese Government. This is the side led by Sensei ASAI 8th Dan. But both sides claim to be the official J.K.A. Time will tell. But for Shotokan Karateka who now visit the J.K.A. I'm sure it's not the same 'Family' feeling that should exist at the HOME of SHOTOKAN KARATE-DO. Let's hope that the two sides settle their differences and get back together as one group, although from what I hear from Japan, this looks extremely unlikely. As someone once said in S.K.M., "There are too many 'strong' personalities in Karate for 'unity' to exist." More splits in the U.K. it now seems. The very popular Sensei MASAO KAWASOE 6th Dan, has resigned from the K.U.G.B. and set up his own organisation called the U.K.T.K.F. (UNITED KINGDOM TRADITIONAL KARATE FEDERATION). This is the U.K. division of Sensei NISHIYAMA'S World body l.T.K.F. Read Kenny Taylor's report on this situation. Sensei Kawasoe is in very senior positions at World level. The same applies for Sensei SADASHIGE KATO 7th Dan, who is now the U.K. representative of one of the factions of the J.K.A. led by Sensei ASAI 8th Dan. Sensei ASAI along with Sensei YAHARA and KAGAWA will be in Britain in April for the course in YORK. In this issue we have interviews with a senior British Instructor, Mike Burnand 5th Dan and also Hassan Gad 5th Dan, based in Saudi Arabia. Plus the second part interview with Sensei TAIJI KASE 8th Dan. So, there's some good stuff there. There are also 'technical' articles and Shotokan news and reports from around the country. Please remember that SHOTOKAN magazine is for 'ALL' people in the Shotokan style and I try hard to feature people from all the many various groups that now exist. I think that the fact that I allow various Shotokan groups to advertise in the magazine proves that I have no 'Political' interest in any particular group, unlike other magazines. SHOTOKAN to me is a 'Family' and it doesn't matter which Association or Club you belong to. Read what Sensei Kase says on this very subject in his part two interview. 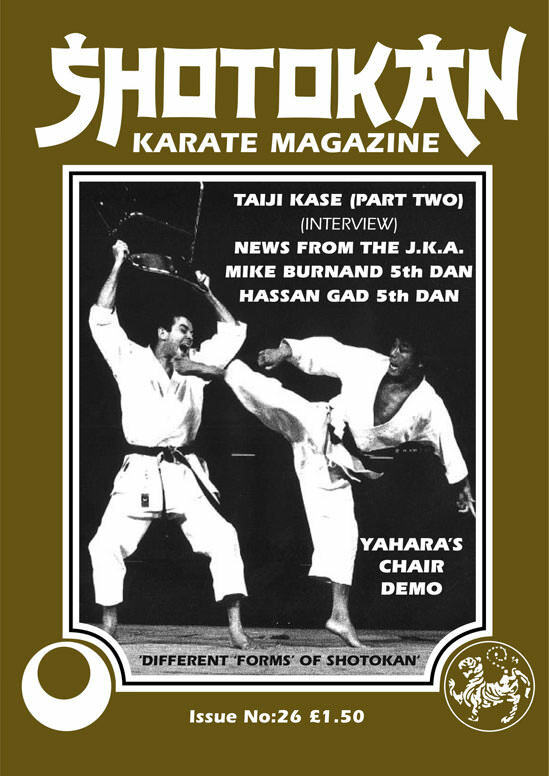 Hope you enjoy this issue and that it will bring you up to date on what is going on in the SHOTOKAN world.